Don’t let the fact that there is not a lot of cheese in these dissuade you – these are so very good and the fragrance of them under your nose while you are biting in makes them all the more better. 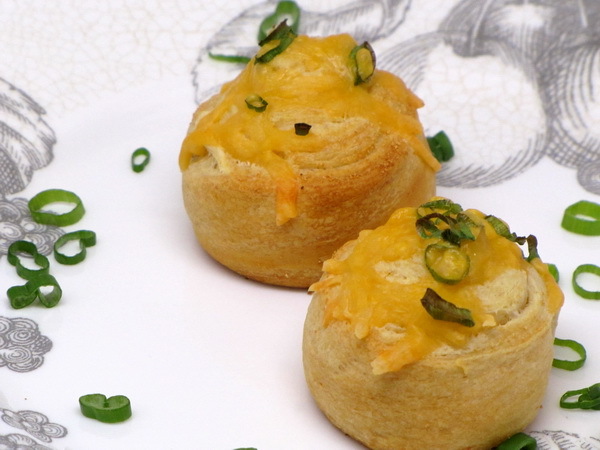 Great as an appetizer or a snack or a side, these cheesy bread puffs are awesome ! Heat oven to 375 degrees. Remove dough from can but do not unroll it. Cut into 8 slices and place slices on an ungreased cookie sheet and place all the ingredients on top of the rolls and press down lightly. Bake 10-13 minutes or until golden brown.